Even the most rebellious kid soaks up most of their worldview from their parents. Like maybe they’ll switch team loyalties when they move away, but they’ll still watch football. The tricky thing is how much of this you don’t even know is happening. For instance, which of these is you? There are parts of your life you live like Red Sanders, and other parts like Mae West. But unless you’ve been in therapy for years to figure yourself out, chances are there’s no rhyme or reason other than that’s how you’ve always done it. And guess where that probably came from. Deciding you want to root for a new team is easy. Realizing the reason you hate exercise is because you can’t stand competitiveness … yeah, that’s a little harder. But here’s the thing. You might have developed your current hang-ups the old-fashioned way; you learned them from your parents. But part of growing up is taking responsibility for your own decisions. If you’ve thought about it and you really believe taking care of yourself isn’t worth the hassle, whatever … you be you. Just don’t inherit that view from someone else because it was too much trouble to think for yourself. 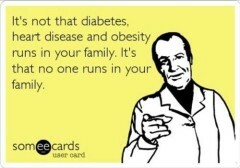 I have trouble believing the whole “it’s genetics” behind many illnesses. If members of your family tend to develop the same illness(es), is it really uncontrollable genetics, or controllable mimicry? How much of those developing illnesses are because you are doing the Exact Same Thing as your parents? Eating the same way, moving (or not) the same way, or even where you live in terms of industrial plants? What if you moved away to a “cleaner” area of the planet, or cleaned up your diet, or got up off the couch, wore different shoes, ex: barefoot shoes as opposed to the full-support shoes worn since you were 2 months old to “help” you walk, or even thought differently (away from the born-as-a-sinner mentality)? How much effect would that have on your health? 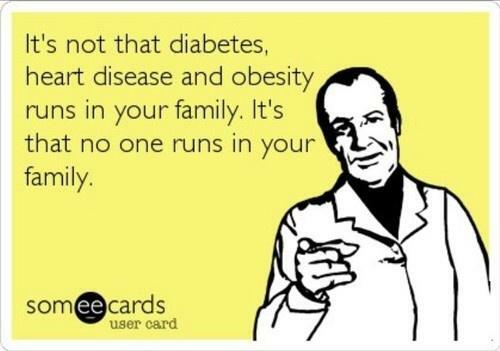 So, really, how much goes genetics play in the game of health vs sickness? I wasn’t even thinking about where you live, but yeah, that has to matter. Growing up in LA vs. growing up in North Dakota, you’re going to have a whole different perspective on outdoor activities.